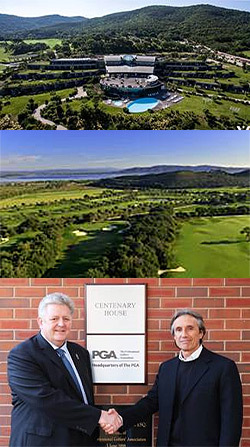 The PGA, England, March 2019; The luxurious and picturesque Argentario Golf Resort & Spa (www.argentarioresort.com) has joined The PGA’s growing list of exceptional branded resorts as the ‘PGA National Italy’. The philosophy of the Argentario Resort revolves around the pursuit of wellness and the respect for the environment. Located next to Porto Ercole and Porto Santo Stefano and an easy drive from Rome Fiumicino International Airport, the Argentario Resort is surrounded by cork-oak woods and centuries-old olive trees in Tuscany’s Maremma region. The 6,800-yard par 71 golf course has been awarded ‘BioAgriCert’ and is a GEO certified course participating in their “on course” programme to continuously improve their sustainability. Located in a protected natural area, nestled between the Orbetello Lagoon, the Tyrrhenian Sea and the hillside, the natural surroundings offer a beautiful panorama and create a microclimate that allows golf to be played at any time of the year. For outdoor sports lovers, the resort offers a swimming pool, two tennis and two padel courts, a mini football pitch and jogging trails. Other services include two highly regarded restaurants, two bars and a 2,700 m² spa and wellness centre which includes a fitness centre with Technogym equipment, bio-sauna with chromotherapy, Kneipp circuit and heated indoor saline swimming pool. The five-star resort includes 73 rooms and five luxury villas, also with incredible views over the golf course, the lagoon and the sea. Each design accommodation features a terrace and is the result of meticulous research on materials and fittings. Emanuele Canonica, winner of the Johnnie Walker Championship at Gleneagles in 2015, heads up the Argentario Golf Academy, which features the TrackMan IIIe simulator, a last-generation platform for the analysis of the swing and the ball’s trajectory and impact. Ottavio Coppola, Golf Manager of the Argentario Golf Club, said: “Argentario Golf Resort & Spa is delighted to be representing Italy in the world of golf through its association with The PGA. Argentario lines up alongside an illustrious group of other PGA Nationals which includes Ryder Cup venues The Belfry and Gleneagles, as well as PGA National Cyprus at Aphrodite Hills and PGA National Turkey at Antalya Golf Resort. All PGA Branded Properties benefit from direct brand association in addition to the specific media, marketing and operational assistance from The PGA to help raise awareness, profile and profitability. PGA Chief Executive, Robert Maxfield, added: “We are delighted to welcome the spectacular Argentario Golf Resort & Spa to our exceptional list of PGA Branded Properties as PGA National Italy! Nearby Argentario Golf Residences is an exclusive collection of bespoke luxury villas boasting ground-breaking design and views of the lagoon, sea and golf course that blend seamlessly into the landscape that can either be rented or purchased. Owners benefit from a range of amenities and services offered by Argentario Golf Resort & Spa, including 24-hour security, property management and a rental programme.